Cemented carbide milling insert is made of carbide alloy. 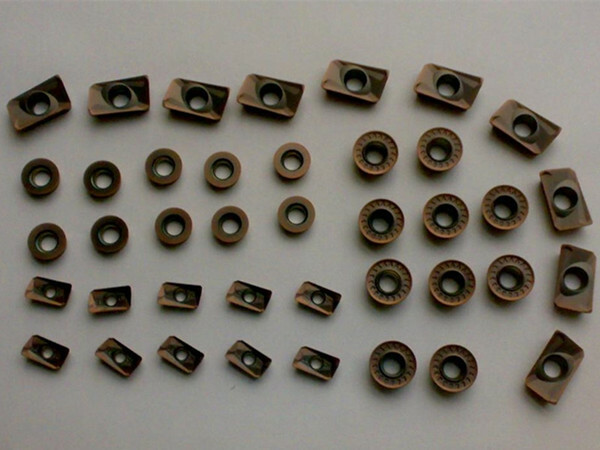 If you want to know the carbide milling insert, you have to know what is cemented carbide firstly. Tungsten carbide takes the WC and TIC as the main ingredients. And tungsten carbide takes cobalt (Co), nickel (Ni), and molybdenum (Mo) as the binder. Then the powder is sintered in the vacuum furnace or hydrogen. Cemented carbide milling insert is mainly used in general machining center, CNC engraving machine. It also can be loaded on the ordinary milling machine and processes some hard and complex heat treatment materials. Milling stainless steel, in addition to the vertical milling cutter and carbide end milling cutter and the parts of the cutter material, the rest of the all kinds of milling cutter adopt high speed steel, especially high tungsten, molybdenum and vanadium high speed steel, which has good effect. Their wear tolerance is higher 1-2 times than W18Cr4V. Suitable for stainless steel milling cutter with carbide grades have YG8, YW2, 813, 798, YS2T, YS30, YS25, etc. Using the spray cooling effect is the most significant. Carbide cutting tools&rsquo; durability can be improved more than double. Taking 10% emulsion as cooling, which can guarantee the cutting fluid flow to achieve sufficient cooling. Stainless steel is easy to stick the blade because of its high adhesion. As a result, the cutting condition deteriorated; When conventional milling, the blade firstly slides on the surface, increasing the trend of hardening. When the milling, the shock and vibration is big, which made the cutting blade easily collapse. Taking the wave vertical milling cutter blade process the thin-walled stainless steel tube, which has fast cutting, small vibration, fragile chip. In high-speed milling, indexable carbide end milling cutting can obtain good effect. Milling the stainless steel, timing milling processing is the first choice. Asymmetric milling method can guarantee to smoothly cut off from the metal. Chip bonding area is lesser. It is vulnerable to be dumped under the effect of high speed centrifugal force, so as to avoid the blade to cut into the work-piece. The atmosphere that when chip impact the surface of the knife blade, it cracks can be avoided.So the durability of cutting tools can be improved. Stainless steel material is widely used in machining, milling, drilling, tapping and so on.